Data Breaches and Data Security go hand in hand and a incorporating a confidential shredding service will benefit you and your business significantly. As a result of people becoming increasingly aware and vigilant of their confidential data and conscious of what readable files are disposed off in their bins, small office shredders are consequently on the rise. Many offices have an office shredder tucked in the corner or next to the printer; but in reality these small devices are putting your employees at risk, draining your time, compromising your security and also shredding your money so to speak. Whereas if you outsource the destruction of your documents to a certified data destruction professional you are eliminating the length of time an employee has to spend feeding the small office shredder, eliminating a data breach, managing your end of life documents efficiently and appropriately reducing the amount of down time an employee spends in the working day. Is an office shredder safe? People don’t realise that if a piece of paper gets stuck in a shredder; most people go to the power point to turn it off. What if it is battery powered? Would you know the shredder was completely powered off? It’s easy to see how with no training, such a simple device can be a danger to a first-time user. The typical office shredder will boast a shredding power of between 3-5 sheets at a time, sounds acceptable but if one is shredding a 30, 50 or 100 page document will soon become a wearisome and time consuming task. Office shredder Manuals will have illustrated that staples, paper clips or other tough bindings must be removed prior to shredding. Taking these out one by one and checking through pages and pages of paper for stray staples or clips is more time consuming than one might think. 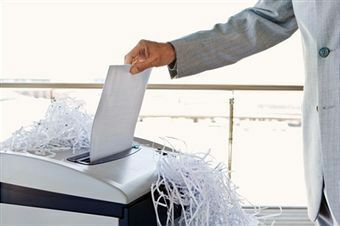 Why shred the documents you might ask? ; The primary reason for shredding your documents should be to maintain confidentiality and security and ensure zero data breaches occur. Many standard budget shredders will cut paper into roughly 40-50 strips, which may seem like a lot, but it wouldn’t take a smart and determined criminal too long to re-assemble 50 strips of an A4 piece of paper and restore it to a legible condition. Therefore by employing a registered Data Processor whom is a certified shredding service professional to complete all your data destruction requirements; will not only free up employee time but eliminate risk of a data breach and maintain the high level confidentiality that you require. It’s difficult to put a cost figure on the security of your information, which is why a professional, efficient and secure shredding service is always advised. The actual cost of an office shredder may initially appear as a cheap investment in comparison to the cost of the services of a certified, registered shredding service provider but from employing a Data destruction service provider you will have little or no employee down-time, guaranteed destruction of documents and 100% total piece of mind. The shredding service provider removes the shredded paper material from the clients location and transports the shredded material to the licensed waste recycling facility and off-loads the material as part of the cost. If you’re thinking of making the change from an office shredder to a registered, certified, professional data destruction service provider, you can contact us for our professional advice and affordable prices. This entry was posted in Data Destruction, Data Protection, Off Site Shredding, Onsite Shredding, Paper Shredding and tagged Confidential Shredding, Data Protection, Data Security, document shredding, document shredding limerick, Dublin Document Shredding, Dumpster Diving, Identity Theft by Security in Shredding. Bookmark the permalink.